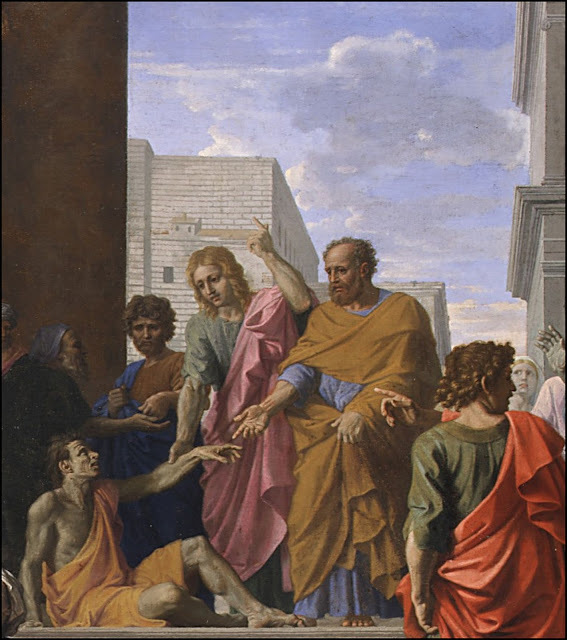 The subject of Saints Peter and John Healing the Lame Man, the first miracle performed by the Apostles after the death of Christ, is taken from Acts 3:1–10. At the gate of the Temple of Jerusalem a lame man begging for alms is miraculously cured by Peter, who asks him to rise up and walk, and John, who touches his arm and points to heaven—the true source of the miracle. 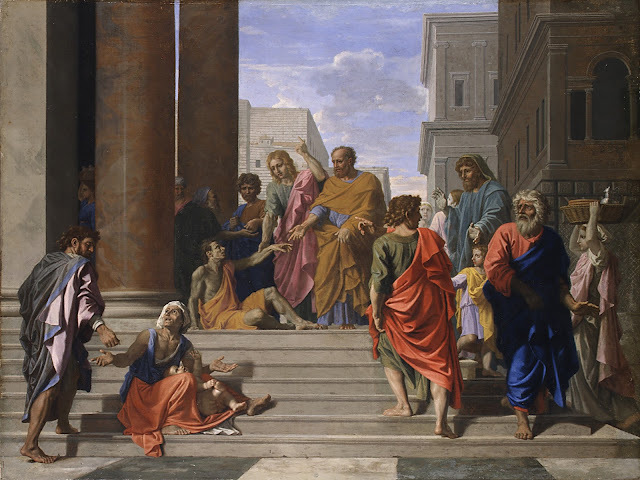 The stairs, at the top of which this encounter is staged, are animated with carefully balanced figure groups, not unlike Raphael's 1508 fresco of the "School of Athens" (Vatican Museums). Some of the witnesses express amazement, while others simply go about their business. The young man on the second step gazing toward the right has been borrowed from Raphael's fresco. [M]ade for Monsieur Mercier, treasurer at Lyons, in 1655 (see Refs. Félibien 1685 and Loménie de Brienne 1695). According to Loménie, it passed from Mercier to a Monsieur de Bordeaux, a financial official, and then to his secretary. All of this must have taken place within a brief time frame, as the picture clearly belonged to the painter Jacques Stella by 1657, the year of his death. The fact that the hands of Saint Peter and the lame man recall those of Adam and God the Father in Michelangelo's famous "Creation of Adam" in the Sistine Chapel is not perhaps a mere detail. The Sanhedrin was an assembly of twenty to twenty-three men appointed in every city in the biblical Land of Israel. This court dealt with only religious matters. The Great Sanhedrin was made up of a Chief/Prince/Leader called Nasi (at some times this position may have been held by the Kohen Gadol or the High Priest), a vice chief justice (Av Beit Din), and sixty-nine general members. In the Second Temple period, the Great Sanhedrin met in the Hall of Hewn Stones in the Temple in Jerusalem. "Amen, amen, I say to you, whoever hears my word and believes in the one who sent me has eternal life and will not come to condemnation, but has passed from death to life. 30 I cannot do anything on my own; I judge as I hear, and my judgment is just, because I do not seek my own will but the will of the one who sent me. What has changed since Peter was last up before the Sanhedrin, or the time that Christ cured the lame man in the Temple precincts to the fury of the members of the Sanhedrin? The Crucifixion ? No. Alone that would have been a single tragic event which, as Pope Benedict XVI, said illustrates "the absurdity of being"
It is quite simply that decisive event called The Resurrection. Pope Benedict XVI explained it in his Catechesis on St Paul in 2008: Saint Paul (11) The Importance of Christology: the Decisiveness of the Resurrection. ""If Christ has not been raised, then our preaching is in vain and your faith is in vain... and you are still in your sins" (1 Cor 15: 14-17). With these strong words from the First Letter to the Corinthians, St Paul makes clear the decisive importance he attributes to the Resurrection of Jesus. In this event, in fact, lies the solution to the problem posed by the drama of the Cross. The Cross alone could not explain the Christian faith, indeed it would remain a tragedy, an indication of the absurdity of being. The Paschal Mystery consists in the fact that the Crucified man "was raised on the third day, in accordance with the Scriptures" (1 Cor 15: 4), as proto-Christian tradition attests. This is the keystone of Pauline Christology: everything rotates around this gravitational centre. The whole teaching of Paul the Apostle starts from, and arrives at, the mystery of him whom the Father raised from the dead. The Resurrection is a fundamental fact, almost a prior axiom (cf. 1 Cor 15: 12), on the basis of which Paul can formulate his synthetic proclamation (kerygma). He who was crucified and who thus manifested God's immense love for man, is risen again, and is alive among us. " "In synthesis, we can say with Paul that the true believer obtains salvation by professing with his mouth that Jesus is the Lord and believing in his heart that God has raised Him from the dead (cf. Rm 10: 9). Important above all else is the heart that believes in Christ, and which in its faith "touches" the Risen One; but it is not enough to carry our faith in our heart, we must confess it and bear witness to it with our mouths, with our lives, thus making the truth of the Cross and the Resurrection present in our history. In this way the Christian becomes part of that process by which the first Adam, a creature of the earth, and subject to corruption and death, is transformed into the last Adam, heavenly and incorruptible (cf. 1 Cor 15: 20-22 and 42-49). This process was set in motion by the Resurrection of Christ, and it is, therefore, on this that we found our hope that we too may one day enter with Christ into our true homeland, which is in Heaven. Borne up by this hope, let us continue with courage and with joy." Pope Francis spoke of the Trial of St Peter and St John in his homily today. "We can only be saved in the name of Jesus Christ, no-one else can save us, not fortune tellers or tarot card readers. On Friday Pope Francis continued his reflections on how the Resurrection shapes our lives and human history during morning Mass in the Domus Sanctae Marthae chapel with employees from the Vatican Pharmacy. Commenting on the readings of the Friday the Octave of Easter, the Pope recalled St. Peter's words: " There is no salvation through anyone else." Peter, who had denied Jesus, now with courage, in prison, gives his testimony in front of the Jewish leaders, explaining that it is thanks to the invocation of the name of Jesus that he has healed a cripple. It is "the name that saves us." However, Peter does not pronounce that name on his own strength, rather he is "filled with the Holy Spirit." In fact - said the Pope - "we cannot profess Jesus, we cannot talk about Jesus, we cannot say anything of Jesus without the Holy Spirit. It is the Spirit that impels us to profess Jesus, to speak about Jesus, to have faith in Jesus. Jesus who is always with us on our life’s journey”. "A humble man works in the curia of Buenos Aires. He has worked there for 30 years, he is the father of eight children. Before he goes out, before going out to do the things that he must do, he always says, 'Jesus!'. And I once asked him, 'Why do you always say' Jesus '?'. 'When I say' Jesus '- this humble man told me - I feel strong, I feel I can work, and I know that He is with me, that He keeps me safe'”. “This man never studied theology, he only has the grace of Baptism and the power of the Spirit. And this testimony, did me a lot of good too, because it reminds us that in this world that offers us so many saviors, it is only the name of Jesus that saves”. “In order to solve their problems many people resort to fortune tellers and tarot cards. But only Jesus saves and we must bear witness to this! He is the only one. " "Mary always leads us to Jesus," as she did at Cana when she said: "Do whatever he tells you”. Let us trust in the name of Jesus, let us invoke the name of Jesus, and let the Holy Spirit push us to say this prayer trusting in the name of Jesus ... it will do us all good."